In March this year I had the privilege of working with Rodrigo San Martin and Adrian on a private expedition to Ojos with three Australian clients. �I was the guide for the Adventure Consultants trip on request from one of the clients. I have guided on many expeditions, including trips to Nepal, Peru, Antarctica, Mongolia etc., etc. �I have just returned from my 5th ascent of Everest (4th guiding trip) after having �3 days at home in between Ojos and Everest, hence my tardiness in emailing you. Hans, your team of Rodrigo and Adrian is exceptional. �They are super professional, super hard working, careful of people and equipment, incredibly knowledgeable and relate as real people to the clients. Obviously I�ve had a lot of food at different camps in different remote locations and I well know how challenging it is to provide something decent and safe and even slightly fresh to eat in extreme environments. Adrian provided us with really delicious food, lots of fresh food, presented with care and all of it safe to eat. It had Anthony, the restaurant owner asking what was in salads. As far as technical climbing guiding was concerned, it was especially good to work with Rodrigo strategising for client management on the hill. Sure, I am IFMGA and have climbed technically, but I value local knowledge - all mountains are different and climbing even relatively easy terrain high altitude is not to be underestimated. 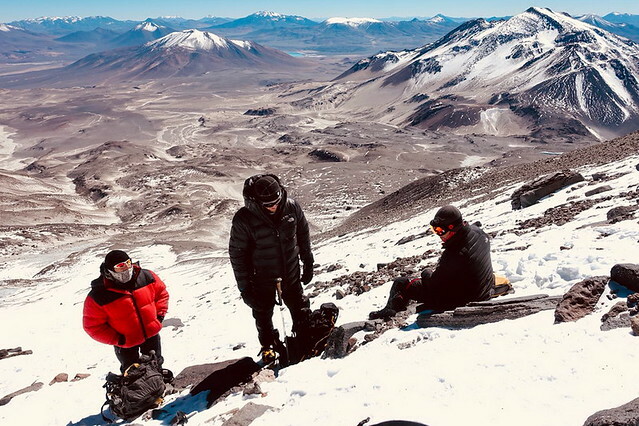 �Adrian and Rodrigo�s experience on Ojos was valuable, and I think we worked out a sound plan and communicated well on the hill (sadly not summiting, I shall have to come back). It was nice to have Adrian�s pre-acclimatisated strength too! I thought that the three of us presented a professional team, and I remain very grateful to Adrian and Rodrigo for their hard work. Last week I was in Australia and met up with the three clients, Chad, Anthony and �Wags� Richard. �They are still super pleased with their trip and glow when reminiscing about the adventure. � Anthony stated that he doesn�t think he has ever laughed as much in two weeks as those two weeks on Ojos. I hope to be able to use SPONDYLUS services in the future.